His sound is so unique that it cuts through the constant chatter of magpies and chickadees. He is insistent, as if he knows I am lying in bed trying to enjoy a short nap in the middle of the day. "Caw! Caw! Caw!" he repeats, over and over again. Oh, all right, I think to myself, slipping out of bed and into my painting pants; five minutes of sleep is all that I really need. I put on my slip-on painting shoes and go outside and find my raven perched up on his branch. The caws immediately turn to the more gentle cluck, click and coo sounds. I cluck, click and coo back as best that I can. Some of his sounds are harder to emulate than others. One particular sound is like a knuckle cracking, a sharp popping sound, but coming from inside his throat. 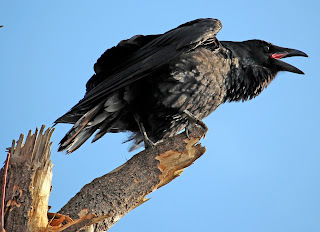 Someone told me that ravens are very smart and social animals, and that once you make a connection with one, it will return time and time again. I really think this is the same bird that comes back and brings a smile - and a lively conversation - to my days. This conversation is going on longer than most. Maybe he is expressing his appreciation for the snack I offered up earlier in the day? He seemed to enjoy grabbing all those bread bits that I threw onto the roof of the studio. "I need to go back to painting," I tell him, walking into Birdsong Studio and shutting the door. It's a beautiful day, but still a little crisp to keep the door open all the time. He calls out to me a few more times before silence settles. The next time I go out, he is nowhere to be seen.